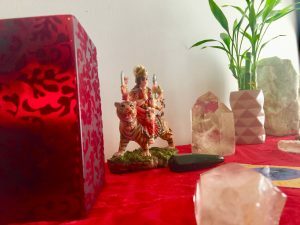 Guided Heart Meditation with Crystal Singing Bowls! Namaste and Happy New Moon in Libra! Awaken Rhythms of Inner Bliss through Moving Meditations. Think of my classes as an inner journey to embrace your beauty, honor everything you’re doing right, and discover how much your body is capable of. I invite you to step into your role as Creative Director of the life you desire. 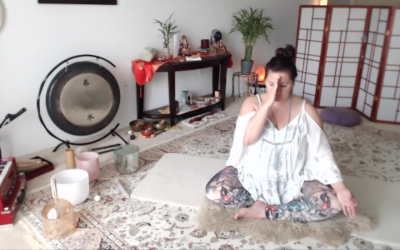 You’ll bliss out through Sound Healing, The MELT Method®, and ancient Kundalini Yoga techniques utilizing mantra (sound), pranayama (breathing), asana (postures), and mudras (hand yoga). You’ll feel open, stronger, more connected to spirit, and calmer in mind. Be sure to check out the updated vibe of INTENTIONAL BLISS. It reflects and aligns with where Amanda and I are now. We hope you feel the call to join us in Tulum! If you’re up for Sadhana this Saturday at 4:30am, I’d love to see you. LOL, yes, you read that correctly, I know it’s early! For me, its part of that whole stepping up to our potential thing I talked about earlier. Maybe it could be for you, too, or not LOL! Details are on my Event Calendar. 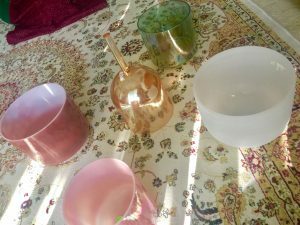 Lastly, as promised, your guided heart meditation with crystal singing bowls on YouTube. Don’t forget to subscribe to my YouTube channel for more! Sending infinite love and light to you all!